DETAILS Four year old Toby probably knows more about flags and their countries than you or I do. This all began with an art project his Grammy devised; the drawing and coloring of national flags. Toby loved using the ruler to draw stripes, then coming back to color them in. Grammy had a flag book, but we have an INTERNET LINK for your convenience as a starter. To make the complicated emblems on some of the flags, Toby’s Grammy either drew them herself or scanned them on the computer, printed them, cut them out and Toby glued them on his flag The flags on our link can be enlarged by clicking on them. This engrossing art project expanded into discussions of color choices and the meanings of the emblems. Grammy has a big wall map in her playroom so she and Toby pinned them on the appropriate countries. Now Toby knows where those countries are, what their flags look like, and a little about what it’s like to live there. 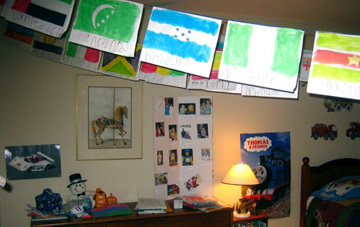 As his interest grew, his Grammy bought a flag book, a sticker flag book and an Atlas for kids and Toby filled his room with over 100 flags he’d made, stringing them across the ceiling. A great art project that can expand into lessons in geography. SKILLS NEEDED Cutting, pasting, coloring, using ruler. Grandparents can help when needed.